Every time we go to Olive Garden…I always get this soup with my meal. Even though I love their salads too. But when I go for lunch…then I would only get the soup and salads…no PASTA DISH. 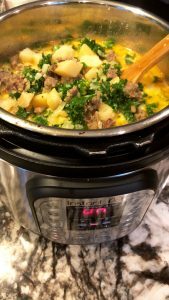 I usually schedule this soup on days that I have a super busy day and I can use my Instant Pot. Usually I would make this soup with some type of pasta for the kids or have it with something that I can pick up at the local restaurant. Sometimes…its some fried catfish or fried chicken. They have this local restaurant here that makes great fried chicken. So tonight, we had Zuppa Toscana soup with some Southern Fried Chicken. Turn your Instant Pot to the saute setting. 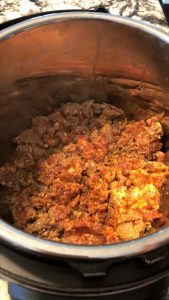 Heat the olive oil in the Instant Pot, then add the sausage and brown for 5 minutes until it’s no longer pink, breaking up with a wooden spoon. 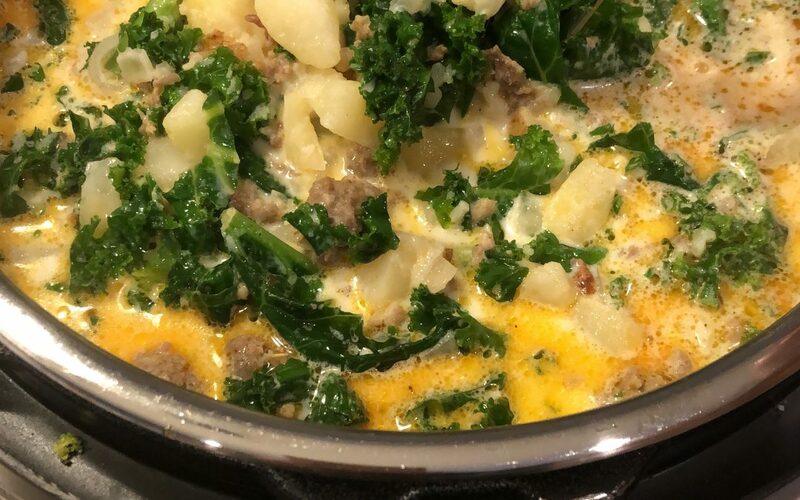 In a medium size bowl….using a slotted spoon …take out the cooked sausage from the instant pot and set aside. Leaving the oil behind in the pot. Next, stir in the onion and garlic and cook for another 3 minutes until the onion softens and becomes translucent. Then, stir in the Tony Chachere’s, Italian seasoning, chicken powder, garlic powder, and pepper. Next, add in the cubed potatoes and the chicken broth. Give it a stir. Once everything is nicely incorporated. Close the lid and turn vent to sealed. 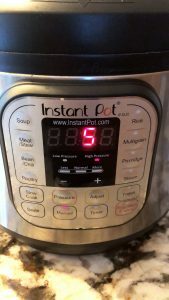 Set the Instant Pot to the MANUAL setting and set the timer to 5 minutes on high pressure. 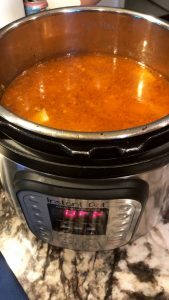 Once the Instant Pot cycle is complete, natural release for about 10 minutes. Carefully unlock the lid and remove the lid from the instant pot. At this point, you can adjust the salt and pepper if necessary. Next, add back the cooked sausage. 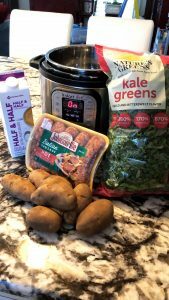 Then, add the chopped kale and set the Instant Pot to the saute setting again. Cook for about 2 more minutes uncovered, until the kale cooks a bit. Then, stir in the half & half or heavy cream (I used half & half tonight…but I prefer heavy cream). Turn off the Instant Pot, by pressing the cancel button and KEEP WARM MODE. Serve the soup IMMEDIATELY…garnished with Parmesan cheese or bacon bits (optional). 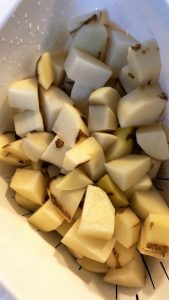 I didn’t have the onions or garlic in the picture because…I already have them sliced and minced when I meal prep. Potato and chicken broth…with all the seasoning. Getting ready to manual for 5 minutes. 5 minutes on MANUAL on high pressure.